Sea Cloisters II is a nice North Myrtle Beach resort that spread out on the oceanfront in the Cherry Grove section of North Myrtle Beach, South Carolina. This oceanfront North Myrtle Beach resort is beautifully landscaped and boasts an oceanfront swimming pool. There are two-bedroom, two-bath North Myrtle Beach vacation rentals at this oceanfront North Myrtle Beach resort and so this is a perfect vacation destination for a family with kids. Whether you are coming from Highway 17 and 11thAvenue North or Highway 9 and Sea Mountain Highway, finding Sea Cloisters II is a breeze. 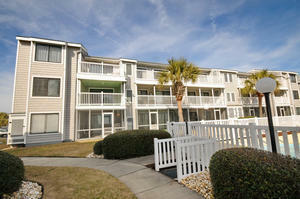 This North Myrtle Beach resort on the oceanfront is nestled between 18th and 20th Avenues North in Cherry Grove. A fishing pier is down the beach and a golf course is just inland from this North Myrtle Beach resort. All of the North Myrtle Beach condominium rentals at Sea Cloisters II have a private balcony that offers views of the Atlantic Ocean. This North Myrtle Beach resort is laid out so that all three of the condo buildings that comprise Sea Cloisters II are near the oceanfront swimming pool and easy beach access. You are going to love your North Myrtle Beach vacation at this resort! White sandy beaches stretch out for miles north and south of Sea Cloisters II. The dunes that run between this oceanfront North Myrtle Beach resort and the beachfront are filled with sea oats that wave in the ocean breezes. Palm trees dot the landscape at this North Myrtle Beach resort, too. The swimming pool at Sea Cloisters II is on the oceanfront. It is fenced in for the safety of your children and it is landscaped beautifully. Lighted in the evening hours, this pool deck really is a nice place to just relax any time of day. All three buildings of this North Myrtle Beach resort are seen from the pool deck. The swimming pool itself is quite a fun shape and the sparkling blue water is most welcoming. Pick a lounge chair and spend an hour or two listening to the waves crash ashore and getting a terrific suntan. From this inviting pool deck you can easily see the path to the beaches. Follow the walkway up and over the wooden boardwalk and down to the sea. It is just a short stroll from the swimming pool and sun deck of Sea Cloisters II. Sidewalks around the swimming pool area and between all of the Sea Cloisters II buildings and the parking areas keep everyone connected. Elliott Beach Rentals is not affiliated with onsite management or the HOA of Sea Cloisters Ii.